As part of the upcoming series of Samford 100 Years events in October and November an expanding list of local businesses and community groups have been working with Samford Commons to develop the concept of a Wellbeing Trail and a Big Picnic in Samford, for 20 October. We all know that Samford has for a long time been a ‘wellbeing destination’ for people to visit and live so the idea of a Wellbeing Trail fits well with the purposes of the Samford 100 years events. Even the train disaster of 1947 is a reminder of the ‘destination Samford’ thinking in that the train which crashed was hired by a city organisation to take its employees and families to the Samford Valley for a picnic. Indeed we are factoring in a ‘Big Picnic’ – the picnic that never happened all those years ago – as part of the Wellbeing Trail event. As reported in a previous column, the main idea of the Wellbeing Trail and Big Picnic is to highlight and celebrate wellbeing as a significant element of the Samford community over the years and to integrate with the other Samford 100 events. Apart from commemorating the ‘picnic which did not happen’ we would also like local and visiting families to have fun and learn about their own wellbeing. Hopefully the experience will also inspire, educate and upskill young and old toward living a life of wellbeing. More on these Trail activities and the Big Picnic another time but suffice to say they will be an event not to be missed on 20 October. Any person or organisation wanting to be part of the Trail or want to help out with volunteering to help steer the Trails activity and Big Picnic should contact us on admin@samfordcommons.org.au or 0407 190 162. Sponsorship is also available to those who would like to associate with the wellbeing flavour and also help the event to be well resourced. Note: Community and member meetings are on the 4th Wednesday of each month, 6.30pm for newbies induction and 7pm for the meeting. Next meeting is on 26 September, in the Blue Building at Samford Commons. All are very welcome. 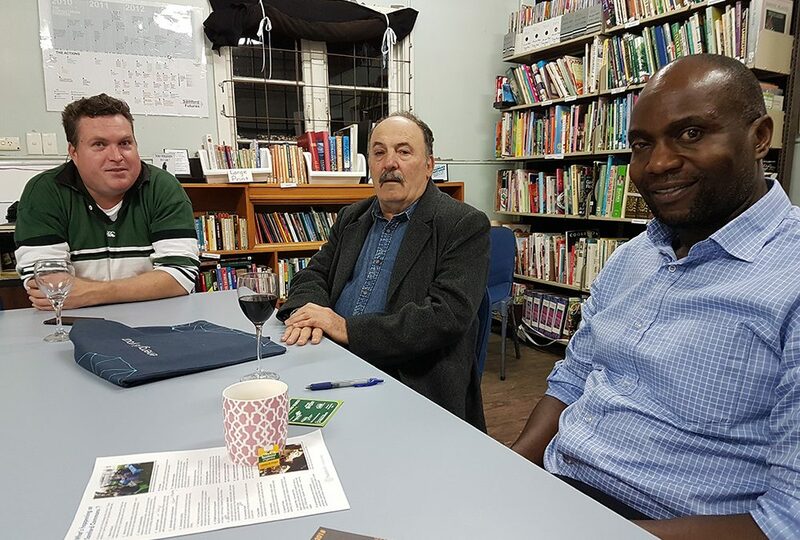 Photo: The Wellbeing Trail and Big Picnic were discussed by Chris (left), Allan and Nick at the recent Samford Commons community meeting.